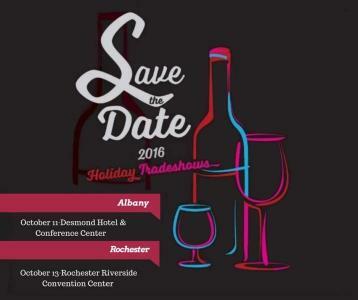 The New York State Liquor Store Association’s (NYSLSA) Annual Holiday Tradeshow will take place at the Joseph A. Floreano Rochester Riverside Convention Center on Thursday, October 13, 2016, 2:30 p.m. – 7:30 p.m.
As a result of NYSLSA’s continued partnership with Taste NY, this year’s Tradeshow in Rochester will feature a wide variety of New York products, such as spirits, ciders, and wines. Connect with over 1,000 attendees; taverns, restaurants and liquor stores. NYSLSA will also be awarding a door prize of $500 to a selected attendee at the Rochester show. The Tradeshow is FREE to attend for those in the restaurant, tavern and retail liquor industry. You must be 21 and over to enter.